This cream is gentle, hydrating and rich enough for the eye area but also non-greasy and lightweight enough to use all over--not easy to accomplish. Neroli (orange blossom), historically one of the most prized and costly essential oils, has an intoxicating floral fragrance and is perfect for delicate skin that needs increased circulation. Frankincense has been in use for so long that it's referenced in the Bible twenty two times. The Biblical references, however, do not include its abilities to rejuvenate aging skin and increase cell production! 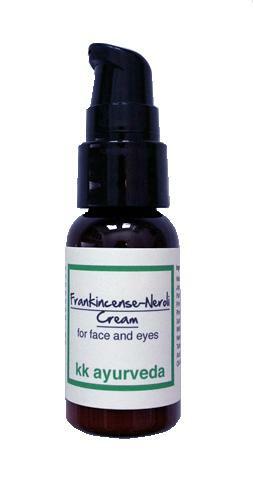 Use on eye area and the rest of your face, if needed, in the morning and evening. May be used over Anti-Aging Serum or C-Berries Serum. Neroli (Citrus aurantium), one of the most costly essential oils to produce, is distilled from the freshly picked flowers of the orange tree and named after an Italian princess. It has relaxing properties, increases circulation and stimulates new cell growth. Neroli is particularly good for dry, irritated or sensitive skin. The scent is powerful, refreshing and floral. Frankincense (Boswellia carterii) is also called olibanum. One of the three gifts given to baby Jesus from the Magi, frankincense preserves spiritual energy and enhances meditation. It's still used ritually in the Catholic church. Used in ancient Egyptian skin-care preparations as well as a preservative in mummification. The scent is woody, rich and balsamic. Water, Grapeseed Oil, Jojoba Oil, Emulsifying Wax NF, Palm Stearic Acid, Evening Primrose Oil, Tocopherol (Vitamin E), Phenoxyethanol, Witch Hazel, Xanthan Gum (Polysaccharide Gum), Organic Black Willowbark Extract, Mannan, Neem Oil, Rosemary Oleoresin, Tetrasodium EDTA, Citric Acid, Proprietary Essential Oil Blend.